One day, when I was old enough to comprehend the words, but still young enough to be impressionable and immune to sarcasm, my mother made a startling announcement to me. “I don’t have eyes in the back of my head,” she said. She may have been washing the dishes at the time, or ironing shirts, or defrosting the freezer. Or maybe she was engrossed in the latest infidelity on Days of Our Lives, or trying to figure out which of the three contestants on To Tell the Truth was the real submarine captain. I was probably working in my coloring book, and asking her if I had picked the right shade of yellow for the canary, or an acceptable blue for Paul Revere’s hat. Whatever we were both doing, I had said something that compelled her to declare this physical limitation. As usual, my struggle for a suitable reply was long and fruitless. I had never entertained the possibility that my mother might have another pair of eyes anywhere on her body; they certainly wouldn’t have done her much good beneath all that thick, black hair. In fact, it hadn’t occurred to me that anyone would have eyes in the back of their head. This was five decades ago, and I don’t think even the most terrifying monsters had such a feature. 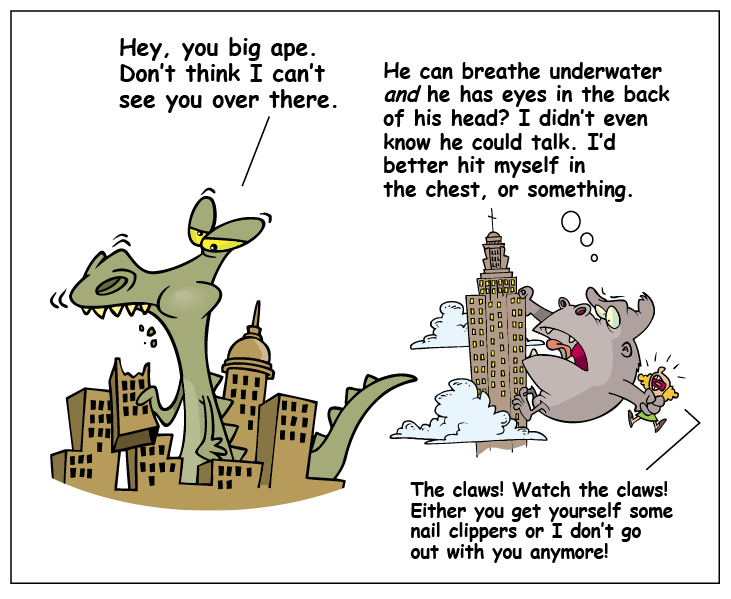 And that’s too bad, because it would have helped King Kong in his disagreements with Godzilla, who weighed fifty-thousand tons, had the ability to regrow lost limbs, and could exhale radioactive fire. Kong was tall for a gorilla, but he didn’t seem to have any special gifts, other than a tendency to beat his own chest — a pretty puny response to atomic breath, as far as I could tell. As with proofreading or searching for a dropped earring, when you’re up against a giant dinosaur that’s eating your city, a second pair of eyes can prove useful. I believed her. For one thing, she was a nun, and nuns didn’t lie. For another, she was writing on the blackboard and was facing away from the class when she said it, yet somehow she seemed to sense that the girl to my right was bugging me to pass a note to the boy on my left. I didn’t know if Sister had thick, black hair because all the nuns wore a habit that covered their entire head. But if she said she had eyes back there, I had no doubt that it was true. I ignored the note. I’m sure that annoyed both the girl and the boy, but it also very likely saved me from the unspeakable throttling I would have gotten if Sister happened to be looking my way – or directly the other way. Catholic school was a place where behavior was paramount. What you did and said, and even what you thought, could land you in big trouble – in this world, as well as in the next. The list of infractions was long, and somewhere near the top was the sin of swearing. I have no memory of my classmates uttering a curse word. It was as though the tongue that formed the blessed prayers in Latin every weekday morning, confessed its transgressions on Saturday, and received Holy Communion on Sunday was incapable of sharing its place or function with profane language. And then there was my aunt, an enormous woman who struck fear in our hearts, but who also brought us delicious pastries and cookies from the Italian bakery. She would sit at the kitchen table and tell stories about her life, punctuating every point with a string of words I wouldn’t dare repeat, even to myself. Sometimes she’d stop, glance over at me, and say, “Pardon my French.” This was more shocking than the actual swearing. I had heard people speaking French before, but had no idea there was any connection. When I entered junior high school and the guidance counselor asked me if I wanted to take French, I was still worried about my immortal soul, and said no, without hesitation. On countless occasions, my mother felt the need to explain why she couldn’t help me untie the knots in my shoelaces – as I’d requested – at the exact moment she was putting away the groceries. Or why she was unable to adjust the vertical hold on the television for me while she hemmed a dress or fed the cat. “I only have two hands,” she would say. Again, I didn’t understand why that was a problem. Two hands seemed to be the limit for every person I had ever met. The octopus in my coloring book had eight, but there was a lot to do, even in the ocean. Maybe you could never have enough hands. Once, I told my father that I couldn’t find my baseball glove. He asked me where it was the last time I saw it. This was an impossible question to answer. That was the very thing I didn’t know – where it was. If I knew where it was, it wouldn’t be lost. I had to conclude that I would likely never see my baseball glove again. And then my father said another one of those things that I hadn’t considered, but that would, from then on, subtly haunt the edges of my mind. “I know,” I said. But I didn’t know. I couldn’t recall ever seeing inanimate objects walking around, but things did disappear a lot, especially from my room. Armed with this new suspicion, I developed a technique for anticipating motion and then turning quickly, hoping to catch a favorite comic book sliding itself under a dresser, or fully expecting to spot my Slinky sneaking down the stairs toward the front door. I’d often attempt to get my mother to locate the missing item for me, but she was usually busy sewing curtains or sweeping the floor, and only had two hands. And while it might have helped if I’d had eyes in the back of my head, I had apparently inherited that deficiency, too. There was a single incident when, in exasperation, I tried speaking French. That didn’t work out so well either. I love your writing! Sharp, right on, hilarious! Thank you, mizzpaw. I look forward to reading your blog very soon. I had a teacher who said something similar: “I know what you’re thinking before you do.” Or something like that. Oh, Charles. There I was, poised to shed a tear when you popped up. Now I am laughing. My mother too had only two hands. I have four. As to eyes in the back of your head. It’s true. Mothers (hair colour immaterial) do have eyes in the back of their heads. Which is reassuring. A health and safety requirement. Whereas one’s father claiming to be all seeing is a catastrophe. And we weren’t even Catholic. No nun in sight. I remember the moment that belief and his authority toppled from its pedestal: My boyfriend, stoned out of his head, had a long conversation with my father and said father (a guy you can’t pull wool over his head) missed the signs. Oh, did I snigger. Silently. So much for investigative journalism. As to your French, and where it all went wrong: Do not worry. The deadly delicious J (friend of my equally delicious son) told me that his French stretches to max three words, vital to get him what he wants in the South of France. Make that four: Merci. Thank you for taking the time, Akshita. I appreciate the kind words. I loved this! Mostly because I say the same silly things to my girls. It’s funny how, as parents, we say the very things to our kids we swore we’d never say. Oh, yes….that was my experience, too. You mean they said these things in Detroit, too? Too funny! Somehow I’ve managed to, not grow them, but somehow make my eyes do a 360 and turn all the way around. Unfortunately my catholic school upbringing did NOT hold back the cursing. That’s probably why God refuses to give me 8 arms… something I pray for daily. I wonder if my kids are just as confused… I keep reminding them I’m not an Octopus. Your comment made me think harder about what it might be like to have eyes back there. I’ve been in cars that have video cameras pointed toward the back, with a monitor that shows the driver what’s behind the car. It’s very confusing. Thanks for the gold star, cat. You always have something nice to say. I remember being very literal in translating adults, but I was pretty young. Today’s kids seem so much more sophisticated. I could picture your Aunt and am Jonesing for those pastries! I have a feeling you live closer than I do to anything like those pastries, Susie. It’s a wonder you never got diagnosed with Tourette’s syndrome, as you herked and jerked your head trying to keep track of your slinkies and your comic books. Another delightful look back at the peculiarities of childhood. Or would that be of adults? It’s all one big peculiar life, isn’t it, Linda? My mother couldn’t read minds. She would tell me, “What do you want? I can’t read minds.” Which is likely a good thing. There are some thoughts I wouldn’t want my mother to read. My mother said something similar, Andrew. Sometimes I wonder how many of these expressions our parents used, and how they got passed around from family to family. My mom used to inform me of a couple of things: she wasn’t Wonder Woman and she wasn’t made of money. I found these things to be obvious, but she wanted to tell me pretty often anyway. 😉 Thanks for sharing another great post! Yes, the “made of money” phrase always stopped me in my tracks. I’d immediately wonder if there were people out there who were made of money. And now that I think about it, I believe there are. Love this! Definitely going to share this with my class when we talk about figurative language and euphemisms! Excellent! Thanks, Katie. I think our parents used that figurative language in order to get their message across, quickly and clearly. It’s amazing how often that failed to work with me. I will no doubt spend my Sunday having random reminders of the ‘literal confusion’ I struggled with then, still does and what I myself has passed on to my unsuspecting offspring. Thanks for mostly brightening up my morning 🙂 Love your art! Thanks, Charlotte. I hope you’re doing well. 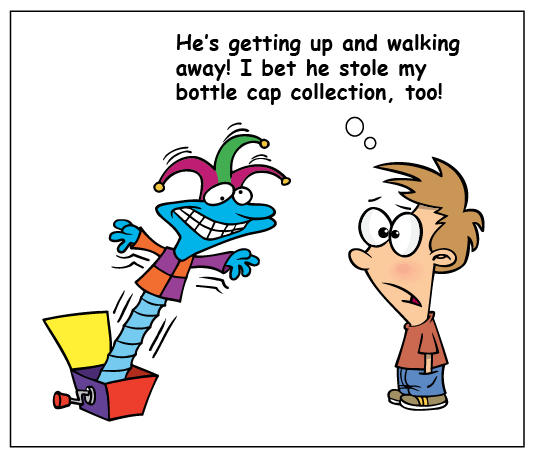 By the way, the original art for most of the cartoons on my blog were drawn by Ron Leishman: http://www.toonclipart.com. It’s a very basic grammatical rule of the French language to apologize in English after each sentence uttered. Bonjour Monsieur, pardon my french. Comment allez-vous, pardon my french? I don’t know. Something tells me she wasn’t really speaking French. Are you sure? I sure didn’t quite understand that. I don’t know about eyes on the back of your head, but the inside of your head must be a wonderful place, both as a child, and now. Have you ever wondered what it would be like to visit another person’s mind, even for a few minutes? I don’t think we could handle it. A couple of days ago I wrote in my blog about paranoia, your BRILLIANT post took me back to my childhood and now I know where my inclination to be constantly looking over my shoulder comes from. Whenever I went out to play my mum would say ‘Don’t do anything naughty, I’ll be watching you’…….!!!!!!! It’s scary enough to have your mother watching. We also had the nuns, Jesus, Mary, all the saints, and Satan, too. Quite an audience. Excellent post! lol I quote ‘ Once, I told my father that I couldn’t find my baseball glove. He asked me where it was the last time I saw it. This was an impossible question to answer. That was the very thing I didn’t know – where it was. If I knew where it was, it wouldn’t be lost.’ This is what my hubby says to me at times even though I’ve told him not to..for obvious reason! It can be an exasperating question, but it can also be helpful. Sometimes retracing our steps triggers a memory that lets us switch tracks, and suddenly remember the missing action. But I never did find that baseball glove. knee high to a grasshopper. I guess it would depend on the grasshopper, but probably pretty short. A very humorous post, Charles, and one I can relate to. I was convinced my Mom did have eyes in the back of her head. Just HOW did she know what I did or was about to do? Spooky. It takes only one sly move on your part to get them wondering, Judy. But I’m sure you figured that out a long time ago. What a delightful post, Charles. How do you remember all those things that grown ups said? My mother said that, too, Ronnie. There must have been a handbook they all studied from while they were raising us. I caught myself saying to my children, ‘If I see you do that again…’ and then realised it implied that they were free to do it, just as long as I didn’t see them! That’s how I probably would have interpreted it, too: as a suggestion that I learn to be sneakier. Thank you, Hema. I always like knowing that we’ve discovered another common experience from childhood. Very funny post. I think my parents favorite was “money doesn’t grow on trees!”. My son is very literal, and we were told to work with him on idioms because he really doesn’t get them at all. For instance, when I ask him to “crack the window” in the car, he is totally perplexed; or when I want to “give him a hand” with something. Every time I catch myself saying one, I now know to explain it…. We borrowed a dictionary of idioms from the library this past spring, with the the history behind all these sayings and had a good laugh as we heard all about where they originated. I wish my parents had thought to elaborate a little, Robin. It would have saved me years of pointless wondering. Merde! C’est un blog merveilleux. Give me a break, Phil. You know the only French I’m familiar with is on the back of cereal boxes. Source de 6 elements nutritifs essentiels! Great post! I used to tell my daughter that both of my hands are busy right now, you’ll have to figure out how to do it yourself or wait until I’m finished. She figured a lot of things out on her own that way. That sounds like a much better approach, Vanessa. Thanks for the comment. I once sensed my little guy doing something behind my back and called him on it, and I overheard him say, “How did you know that?”, when my older son responded, “Mom has eyes in the back of her head she knows everything!” Well, not everything, but I do know with the eyes in front of my head what a great post this was!! You’ve taken the parents’ shorthand one stop further, Jean: you have your kids doing it for you. That’s brilliant. Thanks, William. And I like your poetry. Once again brilliant, funny and oh so true. I’d never heard of that saying, but it makes sense. I find that if two people are talking, I can’t really understand what either one is saying. I did not attend Catholic school, but I assume it would not have been wise to ask Sister if you had chosen the right shade of yellow for the canary you were coloring. As always, a masterfully crafted piece! You assume correctly, Hippie. We were pretty much done with coloring after kindergarten. In school, anyway. I’m glad to hear you had a good birthday. I missed reading your posts. Oh and hey – nuns don’t have eyes at the back of their head, they have periscopes. Funny you should say that, Val. Sometimes the teacher would be out in the hall talking to someone, but she could still see what was going on inside the classroom. At long last, you’ve given me the explanation. I love your recollections about Catholic School. 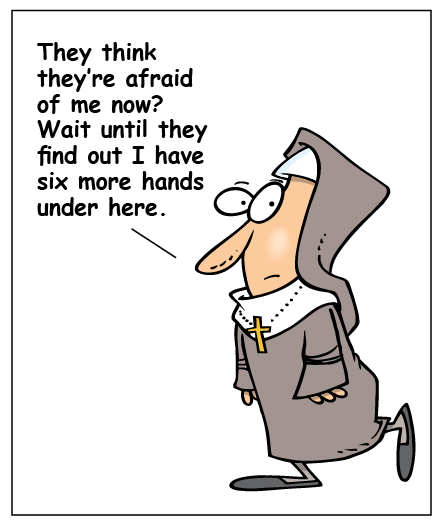 Who knows what the nuns might have been hiding under those robes. An extra pair of eyes would be the easiest to believe. My older brother used to tell me that the principal had a machine gun under her habit. I believed it at least until the fourth grade. This post made me travel back to my child hood when I had to listen the same things. Parents are all same. I agree. On some level, most parents are dealing with the same issues, and tend to say the same kinds of things. I’m convinced, and no one will convince me otherwise, that my two pairs of black eyeglasses walked off. After all, they each have two leg-like ear pieces. I just don’t understand why they’d decided to take that journey away from safety and sustenance. I think that’s why you’re supposed to wear only rose-colored glasses. They tend to love their life, and don’t go looking for something better. If they happen to show up here, I’ll let you know. Meanwhile, please tell me if you see my favorite gray T-shirt. It’s been gone for twenty-three years now, and I’m beginning to lose hope. My aunt was a chain smoker and she had a gravelly deep voice that made it easy to find her in the dark as we sat outside during those family get togethers. I don’t remember any of them speaking French but I was more interested in my own world after all. I’d exchange the gravelly deep voice for some pastries, and also the bar tricks. My all time favourite dealt with turning the camel around on a pack of Camels without touching the pack. Great to know but eating a cannoli would have been better suited for my tastes. That’s a great image: finding your aunt in the dark. I hope you’re saving it for one of your stories. I look forward to check out more of your writing. Thanks, Office Bird. I hope you’ll stick around. I’m sure you would have been an excellent nun, Karen. But your path allowed you to torment your students and your sons. Hey, did I ever tell you that the nuns’ favorite team was the Cardinals? Well, a few of them liked the Angels, but most preferred Saint Louis. My Catholic school career ended in June 1966. I don’t think the Saints were around until the following year. But if I had to guess, I’d say yes, that would have been their favorite team. You certainly have a way of bringing back childhood memories. I think all our parents and teachers (even the Nuns) had the same book of sayings to scare the crap out of us. Thanks for making me laugh today. Scare us or keep us guessing. Either way, it slowed us down. Wonderful and relatable, as always! When I read your title, I thought it was going to be a reaction to the news that Webster’s has allowed the slang definition of “literally” into their new dictionary, which confuses me no end. This was delightful, though, because I remember my mother telling me all these sorts of things. And, of course, when I did take French, the first thing my friends and I did was look up all the English swearwords in the dictionary so we could say them at home and explain we were practicing for class. As to the eyes thing, I was floored when I started teaching and saw a film that explained that nuns would have the picture of the pope on the board just so, such that its glass would reflect the classroom. My mind was blown by the simple brilliance. Our classroom had a framed picture of the Pope on one side and another of our Monsignor on the other. The two reflections probably created a hologram of the entire class. It was hard to get away with anything, although I guess it didn’t help that we weren’t that smart. Thanks for the great comment, Christiana. I used to try and whiz my head round to see if things were walking but I blame Toy Story for that! I did see a monster with eyes in the back of its head… it was on Angel! I must admit, even though I know it isn’t real, it really did freak me out! Toy Story just confirmed what every kid already knew. I’m convinced that my mother had not only eyes at the back of her head, but an extra set of ears and a nose that was out of this world. Her school friends used to call her Nosey. She could walk into a room, sniff around and say, “Something going on in here that I should know about?” – and we weren’t even smoking, or anything, just goofing off. But in later years we realized that eight times out of ten *something* was going on, the odds were in her favor. Maybe this was the case of your mother, Charles. Thanks for another trip down memory lane. Susan, there’s no doubt that the phrase extra-sensory perception came from motherhood, not the supernatural. That’s a great line, Lorraine. I’m surprised my mother never said it. Thank you for both the comment and the re-blog. I appreciate your feedback. I love it! I see it, I get it. I’ve missed your writing, friend! It is always so relatable and effortless to read. Really enjoyed this post! How did I overlook this comment? Sorry! I’ve missed your writing, too! Don’t you wish you could record your children when they say things like that? Hard to do when you’re driving, though.